Green manures (cover or catch crops) can protect and enrich your soil, help to increase yields and economic returns, and bring many environmental benefits. However, the choice of species used and their management is all important. During August we focused on green manures and also on a variety of ways in which value can be added within your farm business (including identifying alternative markets). Our ‘This month’s featured farm’ Jez Taylor, Head Grower at Daylesford Organic Farm in Gloucestershire, strongly believes in adding value through diversity…“Diversity of customers and the varieties / crop types we grow makes the most of what we can produce and protects us from the worst of what the season can throw at us.” Read about how he creates this diversity in the annual cropping plan, rotational system, and through working closely with other departments on the farm, ensuring diversity is created throughout the supply chain. In the blog ‘Breaking the mould in small-scale agricultural developments’ Phil Moore writes about how the Ecological Land Co-operative is demonstrating that small-scale ecological farming is adding value through providing low-impact livelihoods, regenerating marginal land and providing for alternative markets through producing good food for local communities. Trees can potentially add value to your farming system in numerous ways, some of which we highlighted during August… The report commissioned by the Woodland Trust ‘Trees in orchards’ looks at incorporating non-cropping trees in orchards and clearly outlines how, with careful management, they can benefit your fruit production and bring other sustainability benefits (see featured Tweet right). 'A guide to Harvesting woodfuel from hedges’ provides detailed guidance to help you manage different types of hedges and get the most value possible from coppicing for woodfuel. It also emphasises the wider reaching value of hedgerows, explaining why they should be properly managed. 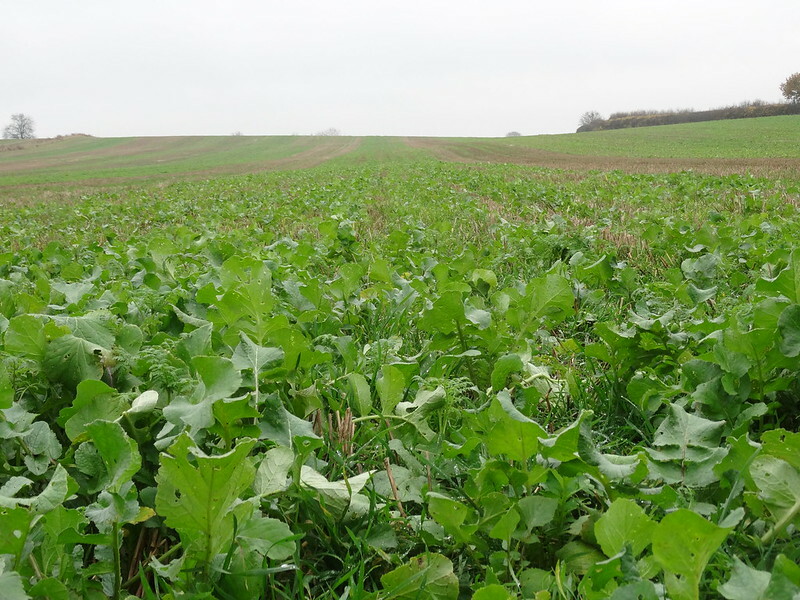 Green manures are becoming more widely used, particularly in arable and livestock systems, and there is increasing interest in how they can be best incorporated into different farming systems. ‘Good Green Manures’ reports from a field lab held in south Lanarkshire comparing four different green manure mixes. You can view information on effects on soil structure and quality, benefits to the following crop, and cultivation costs. If you are interested in getting involved there is another event coming up later this year (see ‘Field Lab: Good Green Manures event, 2nd November’). The webinar ‘Making the most of green manures’ (presented by Ian Wilkinson of Cotswold Seeds, and linked to the publication ‘Sort out your soil’) is packed with useful information to help you make the right choices; helping you select appropriate crop combinations, identify where you might best use them within your rotation, and cultivate them in the most effective way. The recently published GWCT report ‘Cover, Catch and Companion Crops’ explores the many benefits cover crops can bring in relation to soil improvement, pest, weed and disease management, and biodiversity, alongside the challenges, potential impacts on crop yields, and the all-important financial implications. It also contains financial results of cover crop trials run at the GWCT Allerton Project. The report states that direct financial benefit of cover cropping is often measured by yield improvement in the following crops in the rotation. However, longer term benefits may result in reduced costs, better gross margins and increased profitability. All the content featured emphasise the importance of attention to detail when choosing species and varieties in order to optimise the physical benefits you want to achieve within your crop rotation. Polycultures, novel crops, and grassland management (particularly preventing over grazing and poaching) are September’s themes for resources, blogs and farmer profiles featured on the site. Please share your insights with the agricultural community. You can contact us on enquiries@agricology.co.uk and connect on social media; Facebook, Instagram, Youtube. Use @agricology to join in the conversation on Twitter. Finally, there are still tickets for the ‘Agricology Open Day’ coming up on the 14th of September. It will offer a practical demonstration and exploration of sustainable farming linked to content you can find on the website, a host of varied speakers from within the industry who are part of the wider Agricology community, and an opportunity to share ideas and experiences with fellow farmers and growers. The team hope to see you there! * If you want to explore more in relation to the economic impacts, see here for a research review on work funded by the AHDB that NIAB TAG were also involved in. It contains further useful information on yield and economic responses, effects of cover crops, and their management. For growers, there is also a very useful HDC fact sheet that focuses on the financial implications of the use of green manures.